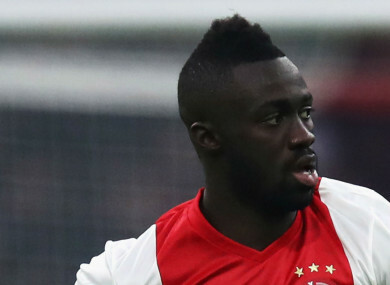 TOTTENHAM’S CLUB-RECORD signing Davinson Sanchez described his transfer from Ajax as a “huge step forward” after completing a medical to finalise the move. Sanchez arrived in London on Wednesday in a long-anticipated deal worth a reported €40million, which could rise to €42m with add-ons. The Colombia centre-back played 47 times for Ajax in 2016-17 as the club achieved second place in the Eredivisie and reached the final of the Europa League. The 21-year-old told Spurs’ official website: “This is a massive opportunity for me because of what Tottenham represent, not just here in England but around the world. It’s a huge step forward in my career and will allow me to continue developing and achieving big things. Sanchez has been handed the number six shirt for the 2017-18 season, with his arrival coming on the same day the club confirmed the capture of Southampton goalkeeper Paulo Gazzaniga. Spurs started the season with a 2-0 win at Newcastle United before suffering a 2-1 home loss to Chelsea, while Burnley are the visitors to Wembley on Sunday. Email “Tottenham complete deal to make Colombian defender their new club-record signing”. Feedback on “Tottenham complete deal to make Colombian defender their new club-record signing”.